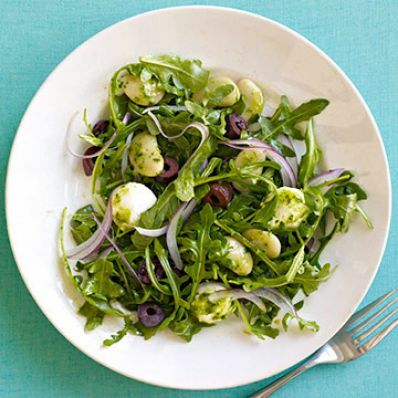 1 of 2 In a large bowl, combine baby arugula, mozzarella balls,kalamata olives, red onion, and butter beans. 2 of 2 In mini chopper, combine basil leaves, fresh lemon juice, honey, Dijon mustard and salt and pepper. Pulse until basil is chopped and mixture is well combined. With blender running, add extra-virgin olive oil in a thin stream. Toss dressing with salad; top with French's fried onions. Per Serving: 4 g fiber, 10 g pro., 280 kcal cal., 688 mg sodium, 5 g sat. fat, 13 mg chol., 17 g Fat, total, 24 g carb.